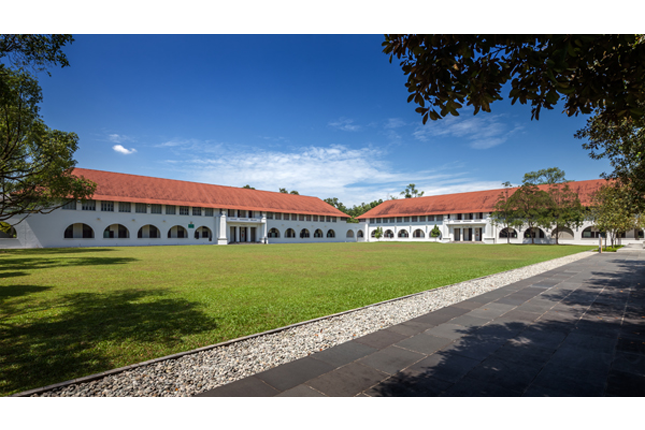 Located next to the Singapore Botanic Gardens, the Former Raffles College is well hidden from the public eye. It was commissioned in 1919 to commemorate the centenary of Sir Stamford Raffles’ arrival in Singapore. As the first college for the arts and sciences in British Malaya, the campus bears testimony to the commitment of the British Administration and philanthropists to provide quality tertiary education for the locals. Prior to the formation of Raffles College, locals had to travel overseas – mostly to England – for their tertiary education. A project committee, led by colonial administrator Sir George Maxwell, was tasked to erect a memorial to celebrate the centennial anniversary of Raffles’ arrival in Singapore. The committee unanimously agreed to build a college, which they thought would be an appropriate tribute to Raffles for his contributions to education and research. This paved the way for the eventual founding of a proper university. In addition to pledges from the Straits Settlements Government as well as the Federated and Unfederated Malay States, donations came from philanthropists who quickly responded to the call. These generous donors included Sir Manasseh Meyer, a Jewish businessman who built the Chesed-El Synagogue; Oei Tiong Ham (黃中涵), an Indonesian-Chinese sugar magnate; Tan Soo Guan (陈思源), a Hokkien businessman; and Eu Tong Sen (余东璇), a successful Cantonese tin and rubber merchant. However, due to various concerns and unforeseen circumstances, the project came to a standstill. It was not until 1928 – a decade after its construction was planned – that the college was finally completed and accepted its first batch of 43 students. Raffles College was only formally declared opened the following year on 22 July by Sir Hugh Clifford, then Governor of the Straits Settlements and High Commissioner to the Malay States. When the Second World War broke out in the region in 1941, the college ceased to function and was turned into a medical facility. 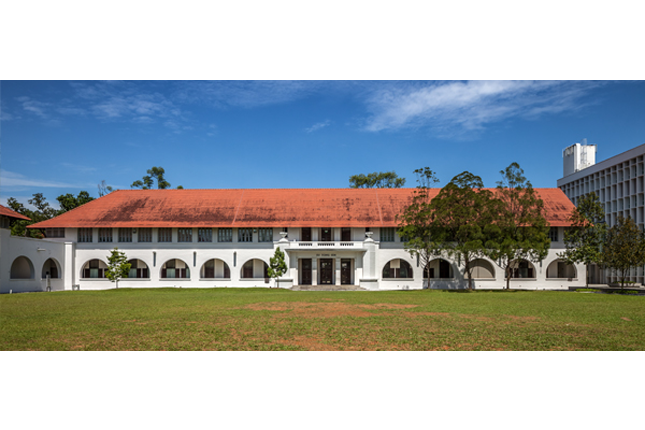 The college compound was transformed into a convalescent hospital and, later, an asylum for the female personnel of the medical department from peninsular Malaya. Among the first patients to arrive at the hospital were survivors from HMS Repulse and HMS Prince of Wales, the two battleships sunk by the Japanese navy just north of Singapore. In light of the imminent war and increased hostilities, college students were recruited as full-time medical personnel in the Medical Auxiliary Service. After Singapore fell to the Japanese in February 1942, the Japanese military seized the campus of Raffles College and established it as the Japanese army’s headquarters in Singapore. Raffles College reopened its doors to students in October 1946. On 8 October 1949, the University of Malaya was founded through the merger of Raffles College with King Edward VII College of Medicine. The enrolment increased steadily over the years, and it soon became evident that the Raffles College campus in Bukit Timah could no longer accommodate the growing number of students from both Singapore and the Federation of Malaya. It was decided that the divisions of the University of Malaya in Singapore and Kuala Lumpur split to form two separate universities. Consequently, the University of Singapore was born on 1 January 1962 and was housed in the compound of the Former Raffles College. 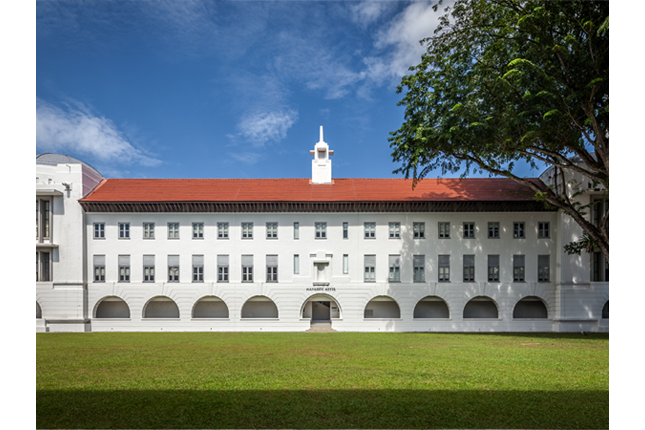 The Former Raffles College was designed by Cyril A. Farey and Graham R. Dawbarn from London, who won a British Empire-wide architectural competition launched for the purpose. They opted for a simple but nonetheless stately design. The buildings within the campus are prominent for their rows of wide arches fringing the arcades on the ground floors, which create a sense of uniformity in the compound. Numerous windows kept the buildings well ventilated, while the spacious verandahs acted as buffers between the walls and the scorching sunrays. Two quadrangles in the compound are surrounded by blocks, three of which are named after the College’s major donors. The Lower (smaller) Quadrangle is fronted by Oei Tiong Ham Building, which served as the grand gateway to the Former Raffles College and housed a hall where important college functions were held. Surrounding three sides of the Upper Quadrangle are Manasseh Meyer Building, Federal Building, and Eu Tong Sen Building. Manasseh Meyer Building is flanked on both ends by cupolas with flattened domes and has a pylon-like tower emerging from the centre of its roof. Over the years, more buildings were added to cater to the growing needs of Raffles College. A new wing named Block A (renamed Li Ka Shing Building) and a Library Building (now C. J. Koh Law Library) were constructed in the 1940s and the 1950s respectively. The iconic Tower Block (formerly the Science Tower) was later built in 1966. The National University of Singapore (NUS, formerly the University of Singapore) relocated to its campus at Kent Ridge in 1981, but the Former Raffles College continued to serve its purpose as an educational institution. 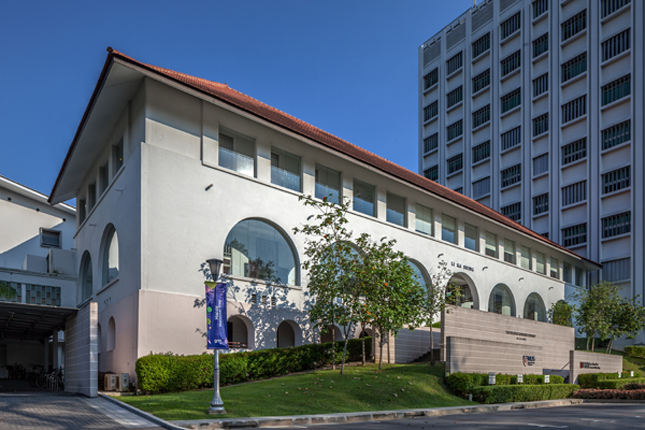 It was home to the National Institute of Education and the Singapore Management University before being taken over by the NUS Faculty of Law, Lee Kuan Yew School of Public Policy, and other research institutes in 2005. 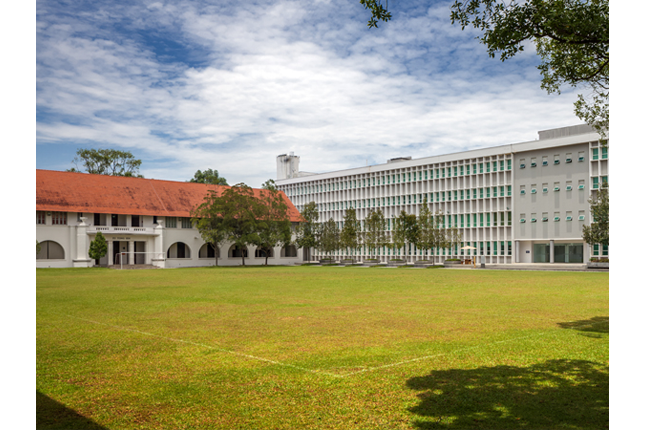 Today, the Former Raffles College compound is known as NUS Bukit Timah Campus.